KERDI-BOARD by Schluter is one of the best ways to waterproof a shower. Here’s why: anybody can install it!!! Plus, it’s backed by a great warranty. A lot of folks like using cement board but it’s heavy and requires a waterproofing membrane over it. Furthermore, if you’r working in an older home KERDI-BOARD fits better than cement board in odd spaces. After today’s tutorial you gain the confidence to transform your old bathroom into a new space. Here’s today’s story: I had to remodel a 120 year old bathroom because the shower looked horrible. Whew!! That old fiberglass surround was nasty. After installing the new tub (you can see that tutorial here) we had to completely waterproof the stud walls. Let me tell you, the walls are in way better shape than they were in this picture!! Plaster and lathe is messy as all heck. I reached out to Schluter to see if they wanted to partner with me on this tutorial since we already use their materials. They said yes and sponsored this tutorial. Schluter also watched the video to make sure it met their quality standards…which it did!! Thus, you know you’re getting good advice. These Amazon Affiliate links support HRT, many thanks when you use them!! Waterproofing this shower involved several unique situations. First, the main wall is angled which in turn makes the plumbing wall a bit challenging. Plus, there’s a knee wall that required waterproofing on three sides. In a traditional bathtub you should add KERDI-BOARD to the main wall. And start by adding the boards at the tub lip that’s either nailed or screwed into the studs. But I took a different approach. This old bathroom has a slanted roof which in turn creates a slanted surface in the tub surround. So we decided to start the KERDI-BOARD installation at that slant, i.e. where the vertical studs meet the angled framing for the roof. We used 1/2″ thick KERDI-BOARD which requires the studs to be spaced no more than 16 inches on-center. Step 1 is to check the studs are16 inches on-center and plumb. If the studs aren’t plumb you should address this problem right away. Otherwise the KERDI-BOARD will be installed incorrectly and this will lead to a poor tile installation. In the picture below you can see the slanted transition in our tub surround. The KERDI-BOARD sits nice and flush with the studs. Only use Schluter screws and washers to attach KERDI-BOARD to the studs. Furthermore, the maximum on-center spacing for the screws and washers is 12 inches. The grid lines make it super simple to find the studs and quickly install screws & washers. How do you attach KERDI-BOARD to the studs? Position KERDI-BOARD on the framing and press a washer into the board every 12 inches up the stud location. Then drill a single screw through the washer/KERDI-BOARD and into the stud. Repeat this process until the entire board is installed on the framing. I almost forgot to tell you this, but we actually used pieces of leftover KERDI-BOARD in this project. Some of the boards didn’t fit the entire length of the main wall. But that’s not a problem. You can cut KERDI-BOARD to any custom size with a utility knife. 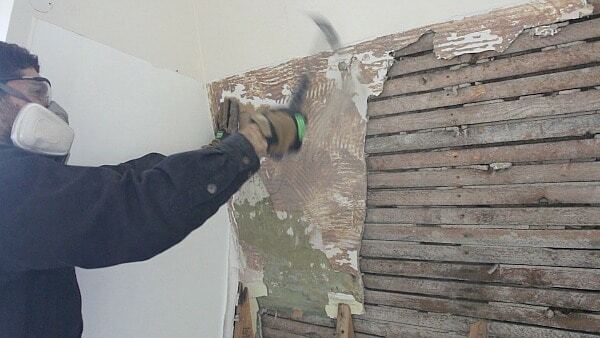 It’s easier to cut than drywall. If you have to cut a KERDI-BOARD to size on the stud just make sure the board only covers half the stud’s width. That way you can place the adjacent board on the stud (this is similar to drywall work). Then you can pinch a washer on the KERDI-BOARD seam and attach both the boards to the stud with one washer and screw. Once the top pieces of KERDI-BOARD were installed flush with the ceiling I had to add the bottom boards. To make this as precise as possible, I measured from the top of the tub lip to the bottom of the top boards at every stud location. Then I got the dimensions for where the knee wall intersected the main wall since one big piece of KERDI-BOARD was used for the lower half of the main wall. After that panel was cut to size and placed on the wall, I installed a washer & screw 3 inches up from the bottom of the tub lip. Then added a screw & washer every 12 inches along the stud thereafter. You can save screws and washers by placing them along the seems. The washer will secure both KERDI-BOARDs to the stud when the screw is tightened. After the main wall is installed it’s time for the plumbing wall!! 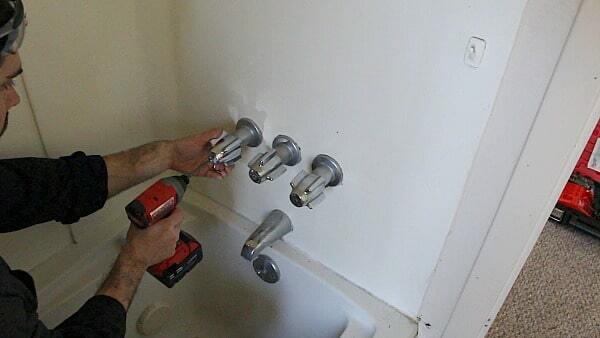 Plumbing walls are always tricky. There are three holes to cut into KERDI-BOARD on the plumbing wall. One for the tub spout, mixing valve and shower arm (it holds the shower head). But this is a breeze since KERDI-BOARDs can be cut with utility knives. Frankly you could also use a steak knife, but that wouldn’t look too professional. In this example I measured from the top of the tub lip to the center of the tub spout pipe. Why? Because the KERDI-BOARD is sitting on the tub lip and not the tub deck. Then I measured over from the main wall to the center of the tub spout pipe. This will give you the exact location of the tub spout on the KERDI-BOARD. Do the exact same procedure for the mixing valve and shower arm. Transfer those measurements to the KERDI-BOARD and cut a circle using a utility knife. If you’re using the Schluter KERDI mixing valve seal, center it on the measurement for the mixing valve. Then trace the outline of the mixing valve seal onto the KERDI-BOARD and cut it out. Slide the KERDI-BOARD over the plumbing and make any minor adjustments with your knife. If you’ve ever worked with cement board you know it is heavy. And any minor adjustments aren’t done with a utility knife most of the time. I secured the board to studs using the same specifications that were used for the main wall, i.e. every 10-12 inches along the stud and 3 inches up from the tub lip. A piece of KERDI-BOARD was added along the edge of the tub. Don’t worry, the door casing is made of PVC and waterproof. But still…it’s not ideal to have door casing in the shower. The final wall to build with KERDI-BOARD was our knee wall. Knee walls are fantastic because they create the illusion of space. And we sure needed that in this small bathroom. I can touch the pedestal sink, toilet and knee wall from one location. We desperately needed a knee wall in this bathroom to allow light from the window to pass into the shower. Tempered glass will sit on the knee wall and provide a fantastic look. It’s going to cost $400-$500 but well worth it. Only three sides of the knee were waterproofed. I installed KERDI-BOARD on the face of the knee wall first and used one screw/washer every 10 inches for extra strength. Then the top using one screw/washer for every stud. And finally the last board was installed just like the other ones. Almost forgot, I did place a small piece of KERDI-BOARD adjacent to the tub just like on the plumbing wall. Here are some pictures of the KERDI-BOARD installation before we waterproofed the seams. I love seeing all the boards neatly installed. It’s a nice feeling of accomplishment. Once all the boards are installed the last step is to seal the seams with KERDI-BAND. The tub lip to KERDI-BOARD transition is one of the most important places to waterproof. Fortunately Schluter has an awesome method for making this leak proof. First, apply painter’s tape to the tub deck. We’re doing this because KERDI-FIX will fill the gap between the tub and first row of KERDI-BOARD. But you don’t want to get KERDI-FIX on your new tub only because it can be messy. Apply KERDI-FIX to the tub lip using a caulking gun. You’ll see in my video that there’s a generous bead of KERDI-FIX in this gap. KERDI-FIX also covers up the screws that hold the tub to the studs. This is nice because the screws are another place where water can leak into the stud bay. Some might think this is a bit extreme, but I don’t care because you can never have enough waterproofing. I also applied a bead of KERDI-FIX between the small section of KERDI-BOARD and tub. My thinking is this, that area is going to get saturated with water and I want it to be heavily waterproofed. Use a 3 inch notched trowel to embed the KERDI-FIX in the tub lip gap. You can also use KERDI-FIX to waterproof where the tub spout comes through the KERDI-BOARD. I chose to do this method but you can also buy special Schluter tub spout covers. The next step is to embed KERDI-BAND into the KERDI-Fix to make the tub to KERDI-BOARD transition 100% waterproof. Now that the KERDI-BOARD is installed you have to waterproof all the seams. And the way to do that is to use KERDI-BAND on every seam and screw. This is important: use unmodified thin-set to embed the KERDI-BAND. Schluter calls for the unmodified thin-set and since they’re the experts I think it’s important to follow their directions. We used Mapei’s Kerabond thin-set. Mix Kerabond according to the directions. It should be smooth, free of lumps and have a slightly more fluid consistency than what would be used to embed tile. The Kerabond should just barely fall off a vertical trowel. To install KERDI-BAND onto KERDI-BOARD you can use two different types of trowels. Use either a 1/4 x 3/16 inch v-notched trowel or the Schluter-KERDI trowel which is a 1/8 x 1/8 inch square-notched trowel. I also recommend having a 5 gallon bucket of water and a sponge to help with this process. Start the KERDI-BAND process at the tub to KERDI-BOARD transition. Apply Kerabond to the bottom 3 inches of KERDI-BOARD where it meets with the KERDI-FIX. Use either the flat side of the Schluter-KERDI trowel or a 6 inch joint compound knife. Comb in additional thin-set with the notched side of the trowel. Keep the thin-set ridges running in one direction to prevent air pockets. Do this for the entire tub to KERDI-BOARD transition. Then embed the KERDI-BAND into both the Kerabond thin-set and KERDI-FIX with the flat side of your trowel. You’ll have to cut a hole in the KERDI-BAND for the tub spout. We prefer to use one continual piece of KERDI-BAND for the tub to KERDI-BOARD transition. Make sure to remove air bubbles between the KERDI-BAND and KERDI-BOARD. Wipe excess thin-set off the KERDI-BOARD with a damp sponge. After embedding the KERDI-BAND you can remove the painter’s tape from the tub. Another important tip: don’t leave the painter’s tape on the tub for more than 10 minutes as the KERDI-FIX will bond to it. Now you can move onto covering the rest of the seams and screws/washers with KERDI-BAND. You’re shower or tub will be waterproof after you complete this next step. Embed KERDI-BAND onto every seam using the same method. Key thin-set onto joint, comb in additional thin-set, center the KERDI-BAND on the joint and embed it with the flat side of your trowel. It doesn’t matter if you tackle the vertical or horizontal seams first. In this example we did the horizontal seams first and the vertical seams next. Always have a 2 inch overlap where KERDI-BANDs intersect. Again, remove excess thin-set with a damp sponge. If you get thin-set on the ceiling remove it. You won’t be able to sand down thin-set!!! Dry fit the mixing valve seal by placing the thicker part of the seal into the KERDI-BOARD. Comb thin-set onto the KERDI-BOARD and embed the mixing valve seal. Apply thin-set to all the screws and washers. Then embed a small piece of KERDI-BAND. Our tutorial on how to tile a shower a shower wall has 9 great tips. 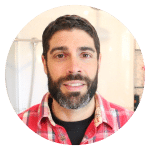 Also, we have a great tutorial that shares how to install the Schluter KERDI shower kit, which is perfect for curbed showers. Hi Jeff, I recently had a cast-iron bathtub removed and a shower put in. The tub had tile all around it so when the tub was removed, they tiled the whole shower with the same tile. I have a window in this shower. I was told to get some water resistant paint to keep the wood around the window from rotting, I assume. Do you know of anything better that I can do to protect the wood. Should I put tile on it? Your thoughts on this would be greatly appreciated. It would be nice to show us a long shot of the finished area so we can see the completed work. Thanks for asking, I’ll look through my photos and post one. This bathroom was super tight and small. I actually had to buy a wide angle lens for my camera to make other videos. Hopefully I took some pictures with that lens. I read one of your posts that says you’re in Pittsburgh. I am too and was wondering where you buy your Kerdi board. Hey Sydney, thanks for the question. We get our KERDI-BOARD at Best Tile here in Pittsburgh. It’s located in Wexford. The prices aren’t bad. Let me know if you have any questions. Hello Jeff. I came across your tutorial when preparing to remodel my shower. I am definitely going to use the Kerdi-Board for the new walls but have question on how to water proof the shower base. I am planning to use a molded shower base, not the Kerdi-base. Do I need to use a membrane underneath the base and bring it up along the walls as shown in some of the videos available on line, or can I just seal it at the base lip, the way you show it above with a tub. Hey Mike, great question. You should be able to set the shower pan and simply slide the KERDI-BOARD over the lip if you shim out the studs. Or you could have the KERDI-BOARD meet the lip of the pan and fill in the gap between the lip and backer boards with KERDI-FIX. If the directions for the shower pan call for mortar under it we recommend using the mortar to prevent any flex in the pan. Keep us posted!! Hi just discovered your videos and they are appreciated. We are about to start a well deserved remodel in our 1950’s circa home and one of the major jobs are the bathrooms master and spare. There is enough space to build a 6′ x 6′ shower in the master and and add a drop in 72″ x 42″ tub I was wondering what sizes should be used for the 3/4 wall dividing the shower from the tub, seating bench in the shower, bench supports, shower flooring, walls encasing the front of the tub, as well as what could be used for framing the walls to hid the tile bases s. We will be doing the construction work ourselves but not the tiling any suggestions would be helpful. I have two windowless interior bathrooms in need of a complete rebuild down to the studs. Is Kerdi board effective on ceilings (or walls with no tile) as moisture retention is a constant issue despite fans running. If so, how would the board be prepped for painting? Hi JT, adding a bathroom fan will help with the moisture and it should be vented to the exterior of the home, e.g. through the roof or wall. Broan or Panasonic make great fans. Just check that your existing fan has enough power and is properly vented. I’d opt for purple board instead of Kerdi-Board for the walls of the bathroom, it’s expensive and not really suitable for paint. It can be used for the ceiling above the shower but only if that’ll be tiled.